I gave away my whole heart. – Where Is My Teaspoon? I gave away my whole heart. Valentines Day. I am so excited for Valentine’s Day and hope you all are too. It breaks my heart when people give out about it and complain about it being so materialistic. Like everything, it is what YOU make it. With this thought in mind, I want to share a sweet pie recipe you could make for your love next Friday. 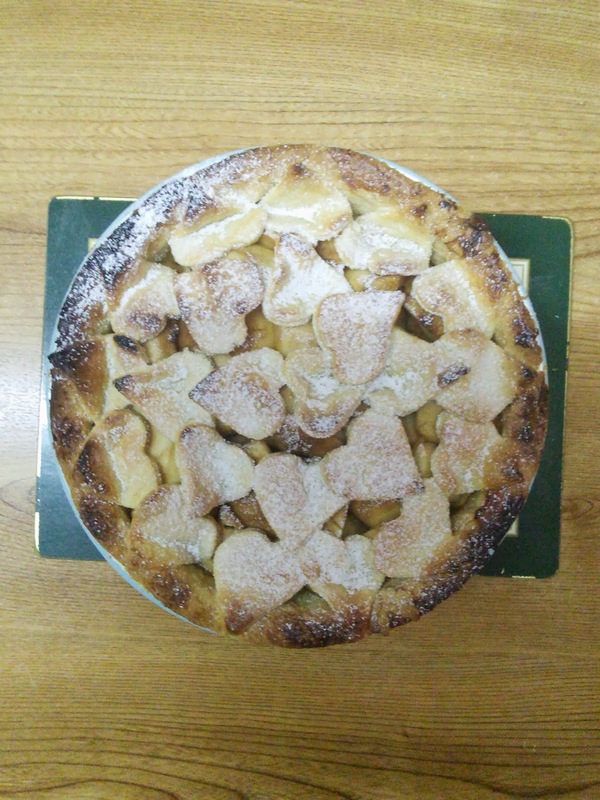 This Spiced Apple Pie looks beautiful and is sure to make your person smile. If you don’t want to give it to anyone in particular, why not invite all your friends over and have some with ice-cream? The topping isn’t a new idea, but is just so simple and effective I couldn’t not show my take on it. 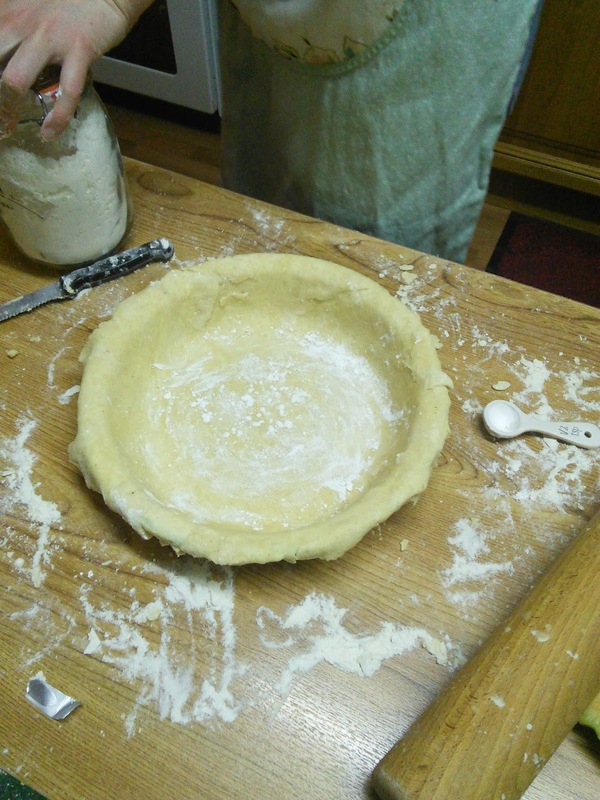 Firstly, you need to make your pastry. If you have made the Ruff Puff pastry in this, then I am very confident you’ll be able to manage this pastry. Weigh out your flour and your butter, rub together until it looks like fine bread crumbs. Stir in your ground almonds. Now, add your water – you do NOT want a wet dough. I’ve only given the measurement as a rough guide. You want the dough to come together but it should not be sticky. In fact it should be dry and falling a little bit apart even. Shape it into a ball and place it in the fridge for half an hour to relax. While your dough is cooling in the fridge, find yourself a pie dish. Try and pick a pretty one, it is Valentine’s Day after all. Preheat your oven to gas mark 6. You can make a start on your apples now. 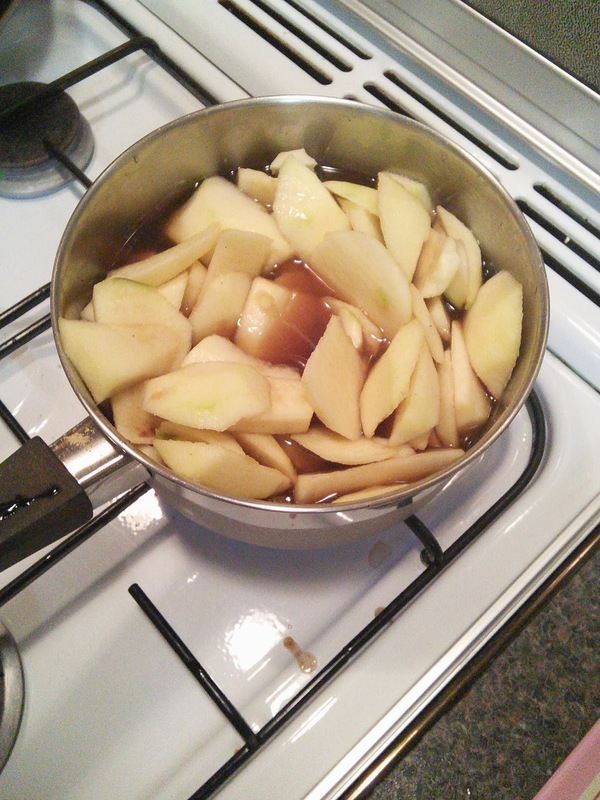 Put your apple juice into a saucepan and add your sugar and spices. Peel and cut your apple into chucks and then add these to the juice too. Light your hob on a very low heat and allow the apple juice to warm up. You don’t want your apple to boil here, you just want the juices to simmer and the spices to be infused. I think this smells lovely and makes a very tasty little non-alcoholic cider for a special night in (might need to be watered down a little bit though). Search through your kitchen drawers until you find yourself a slotted spoon (a giant spoon with holes in it). Use this to drain your fruit from the juice and place it in on top on your pastry. You don’t want to be too precise with the decoration. It’ll work out just fine. If you think more sugar is needed, sprinkle it over the apple now. Remember, it has been sitting in the juice though. Hope back to the fridge now and get that last bit of pastry. Roll it out and cut out heart shapes using a heart cookie cutter. Working from the outside in, place your hearts all around your pie dish (over the apples) and continue this way until you’ve covered most of the pie. You might to dip the pastry in a tiny bit of water just to make sure they stick though. You can be really perfect with the hearts if you want.want. I’ve seen this done and it does look pretty. 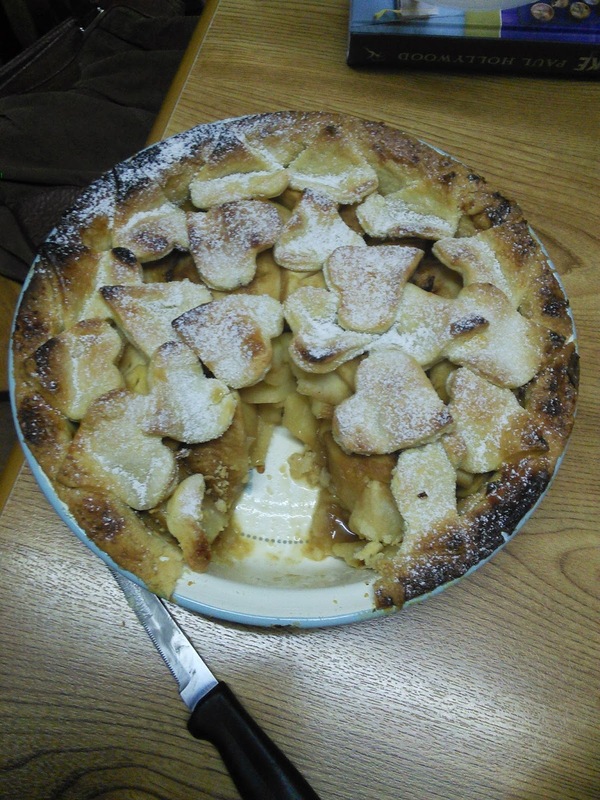 However, I think it’s sweet to be able to look inside the hearts so I always leave gaps, also the less pastry you have the better. Whenever you’re happy, brush your pastry with egg and sprinkle over some normal sugar – this will give the hearts a lovely crunchy and golden look. Off to the oven it goes for around 25-30 minutes, watch it doesn’t burn though – you can cover it with tinfoil to protect the hearts if you want. Enjoy this Sweetheart Pie with custard or ice-cream and, of course, tea. Now, who still hates Valentine’s Day? Not me. No sir eee. Previous Post Huff and puff and see if I care.